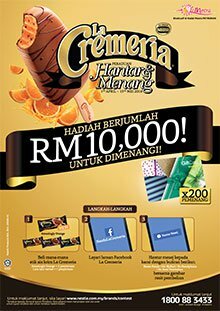 Home » Facebook » Food n Beverage » lucky » lucky draw » Nestle » Petronas » purchase » spend » Peraduan Nestlé La Cremeria "Hantar & Menang" Contest: Up to RM10,000 prizes to be won! Purchase one (1) Nestlé La Cremeria Stick (Amazingly Orange = 2 entries / other variants = 1 entry) from any PETRONAS outlets in a single receipt within the Contest Period. Visit La Cremeria Facebook page. Send a message via the Facebook page with your full name, MyKad number, mobile number, clear picture of the receipt and receipt number. Keep the official receipt for prize redemption and verification. Visit Nestlé La Cremeria "Hantar & Menang" Contest terms & conditions (English or BM) for more details.